Motherwell fans’ online reaction to Sunday's 7-1 drubbing to Rangers at Ibrox saw paying punters demand a refund for how poor their side was, writes Craig Goldthorp. And, when you hear ’Well gaffer Stephen Robinson and defender Richard Tait apologising while admitting that the team ‘chucked it’ after conceding the fourth and fifth goals, it’s hard to argue against the ’Well diehards being reimbursed. Quite simply, this was a caning of epic proportions and Rangers could have reached double figures quite easily. But I also think that the result has to be put into some sort of perspective. Before Carl McHugh’s 32nd minute dismissal and concession of a penalty which Rangers scored to go 2-1 up, Motherwell had been competing well. 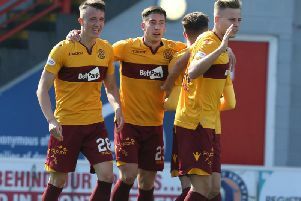 Curtis Main’s equaliser after Ryan Bowman’s superb set up play seven minutes earlier was merited, as the Steelmen again went toe to toe with a side they’d drawn 3-3 with in a Fir Park thriller earlier in the season. However, Thomson’s decision to send off McHugh for handball and award a spot kick changed everything. From the moment that the Irish midfielder trotted off the field, the Lanarkshire side’s chances of getting anything from this match were akin to Rangers forward Alfredo Morelos being able to go 10 minutes without writhing on the ground with a mystery injury. Although Thomson’s popularity (or lack of it) with Motherwell fans is right up there with Rangers supporters’ love of fellow whistler Willie Collum, I don’t think the man who ridiculously sent off Cedric Kipre and awarded Celtic a penalty for a nothing challenge on Scott Sinclair in last season’s Betfred Cup final loss was at fault on this occasion. TV replays show that McHugh’s arm was raised and the ball was heading towards goal from Andy Halliday’s shot. So therefore the penalty award was correct and McHugh – already on a yellow card – had to go. Motherwell manager Stephen Robinson said as much during the post match presser, although he did take issue with McHugh’s first yellow card for an innocuous challenge on Morelos. The Steelmen gaffer said: “I thought it was a penalty. “The letter of the law suggests that he needs to be sent off. “The first booking’s a disgrace, it’s embarrassing. “And I have to say the referee’s getting conned continually by the same people. “The first one should never have been a booking. “He was given the yellow card for continual fouling but that wasn’t a foul. “Certain players get away with certain things every week. Questioned on being sent to the stand for his conduct after the penalty award, Robbo added: “Members of their staff came up to voice their opnion. “That was it. I was the only one sent to the stand. “I don’t think it was a major incident. Steven (Gerrard) even said: ‘Look don’t worry, I’ll sort it out’. “In other words, ‘I’ll deal with it and tell the staff to sit back down again’. It’s an emotional game. “But as usual it was made into something.